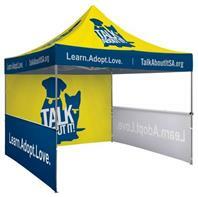 This canopy ismade from 500 Deniers, waterproof, UV protected and fire retardant polyester,offering a choice of 12 colors. It can be printed in silk-screen or digitalprint. Velcro strap for tight material assembly. Light and tuff aluminum orsteel structure with ultra-resistant patented polymer mechanism, retractablearm with automatic tension & adjustable legs, for a fast & effortlessinstallation keeping the top nice & tight. Delivered with the canopy only,complete your installation with half or complete walls to increase yourvisibility and extend your advertising areas.